A demo for a self-declared homage to “legendary free game” Cave Story that still isn’t out four years later, this one-stage trial version of Vegetables has enough going on in it to commend it on its own merits. An action platformer with a relentlessly cute, lo-fi pixel art aesthetic, you take on the role of Lop Holland, a furry rabbit and fighter for the 08th Special Forces Squadron, a specialist with a carrot gun that can shoot up, down, left and right. What I liked most about the game is, first, the vividness and liveliness of the animation for the main character and his tomato enemies and, second, the cleverness of its level design. The game lets you see paths early on that you’ll have to navigate later, making you wonder if you’ll encounter ability upgrades that will allow for better map traversal. The game holds back on its cat archer enemies (your fight is with the invading carnivores, apparently) until you make it to roughly the halfway point of the stage, but you can see them from the very first screen of the stage. Stage design and enemy placement are very sharp, and after I finished the game, I found myself admiring the subtly ingenious idea of a twisting spiral of the level as well as the seeming variation generated by a meager two enemy types deriving entirely form clever implementation. The game doesn’t quite feel finished even as far as this goes (compare the stiffness of the mice enemies in contrast to the lovely animation for else that moves), but it’s decidedly playable and Lop has jump that’s fun just to execute. The project has a website (Japanese only, includes art, previews, and 4-panel comics) but, alas, it hasn’t been updated in over four years. It seems this may be all we ever see of Vegetables. 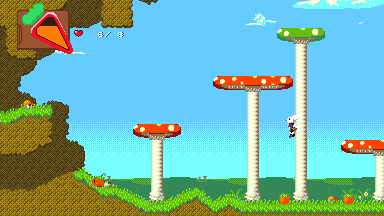 Controls for the game are: Z to shoot your carrot gun and X to jump. Press down to read or interact with characters. Space calls up a pause menu. The game has some Japanese-language comic text when you reach the end of the stage, but this version of the game is otherwise without dialogue. You can download the trial version of Vegetables for Windows from Freem.